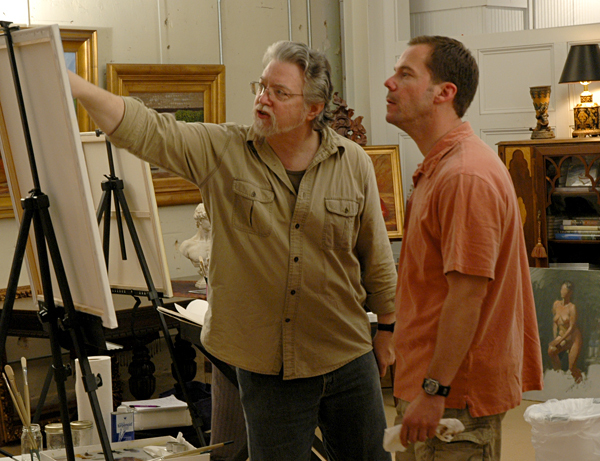 I teach the fundamentals that artists need and can use regardless of style or subject matter. Charles currently teaches at The Art School at Binders in the Buckhead area of Atlanta. He holds classes on Tuesday afternoons and evenings. Informative and passionate, Charles approaches art instruction by addressing visual principles and the material power of technique to equip the student with the skills to fulfill their own artistic vision. Charles is also available for workshops. Please contact the studio if your organization would like to sponsor one in your area. I teach because artists who want to paint in a representative manner need to understand the visual language. My approach to teaching is based on knowledge passed down from artist to artist and I teach from that background of good instruction I received in New York. Art is not magic and great art does not just happen. My class is not for the art student who wants social time or fun time. My class is designed for the student who is tired of going to class and not learning anything, or learning very little. Art can be taught. After years of frustration after completing my art degree, I went to New York to study and found the training I needed. And so I understand the artistic hunger for good instruction and I don’t waste time in my class with unnecessary gimmicks or tricks. I teach the fundamentals that artists need and can use regardless of style or subject matter. I do not teach my students to copy what is before them but rather to respond to, to interpret, the subject. I use the still life and live models to teach my students to see and think in an artistic manner and to develop their aesthetic taste. Observation from life, not photos, is how your eyes, your mind, and your hand can develop artistic honesty. "You are one of the best teachers I have ever experienced." "I really can’t say thank you enough for the valuable and life changing instruction I have received in your classes over the last year! I have grown so much thanks to your teachings… I will be back to learn more!! Keep being awesome." "I have just signed up for your class and am looking forward to it tremendously. I did like the results of the first session. There may really be some talent hidden in my brush. If so, I am certain you can help prod it out!" "I appreciate your passion for painting and thank you for sharing your enthusiasm with your students." "Just a note to tell you how very much I enjoyed the class. All three days were an eye-opener for me. I think sometimes we get ‘stuck in a rut’ and I’m afraid I was. Didn’t realize it until you came into my life – and art. I can’t thank you enough – for everything you taught me – your patience, sharing your vast knowledge, your humor. It was just an incredible weekend! Can’t wait to do it again." "Did I mention how much I am learning from you? Did I mention how much I am enjoying it??? Thank you for being a wonderful instructor and a good friend. Even though I am always slammed with 3-D contract work and unable to paint daily as I would like, this class is really giving me a feeling of accomplishment." "I have learned so much, Charles, and I look forward to what will come next, I know its miles on the brush. Just never thought it would be such a long trip for me. Thanks for your presence in my life." "I love painting with all my classmates under your lead and feel so much better about myself after seeing my progress. I want to thank you and let you know how much I appreciate you being such a great teacher." "I came into your class all confused about what exactly is art, and you have clarified that for me in so many ways. I really, really appreciate your excellent teachings. I still remember one of your first teachings. You said: “It’s okay to make mistakes. Just scrape it off, or pick up more paint and do it again.” Since I almost stopped painting for the fear of failure, it was so liberating to hear that. Oh, and I love it when you give us scientific explanations behind art theories. That’s when I really knew you were the right teacher for me. I have learned so many valuable things from you." "I wanted to tell you how excited I am about studying with you. Your class is exactly what I was looking for. I’ve learned so much in 5 weeks and am trying to put in the work to improve. I’m looking forward to picking up with you again." "You have been a very important person in my development as a painter and I certainly plan to study under you when I can." "I really enjoyed the workshop here in Chattanooga, it was great. You are a true master of the art of oil painting. You really have a great way of communicating and explaining the technique and methods. You have given me much needed confidence in my journey to master the art." "Thank you so much for the wonderful workshop last weekend, I’m so glad I attended. I learned many good things. Thanks for sharing your knowledge." "I am amazed at how many of the little insights to come from your instruction have remained with me, and I feel like we have only scratched the surface! You are a great instructor as well as a gifted artist."